I just couldn’t see any way to close the distance on the heavy-antlered whitetail feeding at the far end of the harvested cornfield. The wind was wrong for a stalk around the west edge of the field, and several does and fawns feeding along the east edge effectively blocked that approach. It was late muzzleloader season, long past the peak of the rut when grunt tubes and rattling horns supposedly lose their appeal. But I’ve always figured nothing ventured, nothing gained when it comes to whitetails, so I dropped my daypack and unlimbered the rattling antlers along with a loud grunt tube. After getting comfortably situated at the base of an oak, I started rattling as vigorously as my bulky cold-weather gear allowed. Every deer in the field quit feeding and stared at my position. Keeping the antlers low to conceal the movement, I rattled again, and a small buck started my way. I figured the bigger buck would hang back, but before junior had made 50 yards, the big boy snorted and the smaller deer stopped in its tracks, leaving little doubt about which buck was the dominant one. Then the big deer started ambling my way. When the buck stopped at 200 yards, I gave a couple of grunts to further pique his curiosity. Worked like a charm as he started my way again. As he passed the 75-yard mark, I settled the bronze bead of the front sight (Minnesota doesn’t allow scopes during muzzleloader season) in the notch of the rear sight on his chest and waited. At 60 yards, he started quartering away, offering an ideal shoulder shot. When the smoke cleared, he was down for the count. Love it when an unorthodox tactic works. I believe hunters are the ones who often get in a rut during the long deer season, expecting deer to do exactly what’s expected on every occasion. I also believe this greatly lowers their chances of success, especially late in the season when the deer don’t seem to be following anybody’s rules. I was on a January hunt in Alabama, where the property manager had told me to forget about rattling that late in the season. He also added that grunt tubes didn’t work well any time on the ranch. In three days I rattled and grunted up 14 “shooter” bucks. At one point, five river-bottom boomers were circling my ladder stand. Whether you are hunting from a stand, spot-and-stalk hunting or still-hunting, from time to time it pays to step outside of the box of conventional thinking. That doesn’t mean you run around doing whatever comes to mind. But you shouldn’t be afraid to hunt aggressively and try unorthodox tactics when the occasion warrants—as long as you hunt smart. A few years back, I was consulting and hunting with another outfitter who had leased a chunk of ground along Montana’s famed Milk River. He’d already spent considerable time scouting and glassing deer moving from the heavy bottom cover into adjacent barley fields and had placed several stands to take advantage of those travel patterns. But then, the day I arrived, the farmer he leased the land from harvested most of the barley. Talk about getting your wires crossed. The following evening, the first day of my hunt, a total of one doe walked under my stand. The outfitter wanted to move me to another part of the ranch, but I had noticed a small field of barley still standing and convinced him to move a stand to cover the approach to that one unharvested patch of grain. Late the following afternoon, at the start of prime deer movement time, the farmer drove in with a combine and started harvesting this small field, too. I had several good shot opportunities, but wasn’t quite sure where the vitals are located on a John Deere combine. The farmer hadn’t finished the field by dark and left a 10-yard strip along the far side. All was not lost. At noon the next day, the outfitter and I set up another tree stand on a trail back inside the woods, in hopes of ambushing a deer on its way to the remaining barley. I figured with all the disturbance of the past few days, the deer might be hanging back until after dark. That evening, I put an arrow through a 150-inch buck at last light after a number of does and fawns had already moved past my stand. Aggressive but smart hunting had paid again. Scouting is one of the most important aspects of hunting smart, especially important when you are thinking about throwing something different into the mix. I tend to spend more time scouting than I do actually hunting. While I was on that Montana Milk River hunt, glassing when not actually hunting, I couldn’t help but notice a number of good bucks moving out of a dense willow thicket past a fence corner and then returning along the same route in the morning. I pointed this out to the outfitter and suggested he dig a pit blind, something he’d never even considered. The day after I tagged my buck, I helped him dig the pit and then transplant snowberry and willow bushes around it for cover. According to the outfitter, every season since his clients have taken good bucks from that pit blind. On my own leases, my guides and I never stop scouting, whether we have clients in the field or are between hunts. This information helps. However, it’s how we act on it that brings success. A couple of years back, I was lucky enough to draw a late-season license for myself, and even though I’d already spent every day of the season glassing deer and scouting the leases, I spent the first three mornings and evenings of my own hunt scouting some more. Two evenings in a row, I watched a humongous buck feed with other deer at the upper end of a soybean field. I spent the middle of the third day driving around the field, scouting out a perfect ambush location for that evening. I never walk around a whitetail hunting area unless there is no alternative, as I prefer my hunting areas to be as undisturbed and sanctuary-like as possible. The more the adjacent areas are pressured, the more valuable this becomes. In fact, we insist on driving all of our clients right to their stands, and they stay on those stands until we come to pick them up. This eliminates those tell-tale human scent trails, not to mention the sightings and intrusive noises that alert deer to human encroachment. If you hunt on your own, ask your wife, a friend or hunting partner to drop you off and pick you up. Deer everywhere seem to be less suspicious of vehicles than of people on foot. On a number of occasions when I haven’t had anyone to cart me around, I’ve driven myself to the stand, parked the four-wheeler up against a tree and covered it with camo netting. The deer often reappear within minutes. If you must approach on foot, take the time to plan a route with the wind in your favor and minimal chance of jumping and spooking deer. One of the least appreciated aspects of stand hunting is the need to also leave the area at the end of the day without alerting any nearby deer. You can ruin the best location by spooking deer after legal shooting hours same as you can by spooking them in the dawn’s early light. It only takes one such happenstance for a wary, mature buck to vacate the area for parts unknown. To hunt the trophy buck I’d been watching in the upper end of that alfalfa field, I parked a half-mile away in a downwind cul-de-sac and then hiked in through thick brush, staying completely out of sight of the upper end of the field and also the surrounding hills. The weather was colder than a well digger’s bottom with a blustery northwest wind blowing snow right into my face. In a deep ravine behind the chosen stand site, I donned a white Heater Body Suit and proceeded a step at a time to the base of an oak tree 10 yards back from the edge of the field. Within a half-hour, I was covered with a thin layer of snow, proof positive of the insulation quality of the suit. An hour after that, 30 deer were feeding within 50 yards of my snow-covered form. A respectable 10-point stepped out of the brush and walked within 10 feet of me, never suspecting I was there. Legal shooting time expired without the big one making an appearance, although there were a half-dozen mature bucks in the field, most of which a client would have taken gladly. To get those deer out of the field without alerting them to my human presence, I eased my ever-present coyote howler to my lips and cut loose with a series of howls that sent every one of them plunging for cover. I then slipped unobtrusively down the draw and out of the area, already making hunt plans for the following evening. Spot-and-stalk is the epitome of Western trophy hunting but rarely tried in the denser cover of the East. More’s the pity, as it can produce a thrilling and successful hunt under the right circumstances. A good friend in Indiana once spent two weeks off and on glassing a humongous buck from across an open section of harvested beans. The buck bedded in a little weed patch in a fence line with only one viable approach. With the aid of a spotting scope, my buddy spotted the buck’s rack sticking out of the weeds on several occasions, but the wind was never right for a stalk. A less patient man might have forced the issue, but my firend knew he’d only get one chance at this buck. 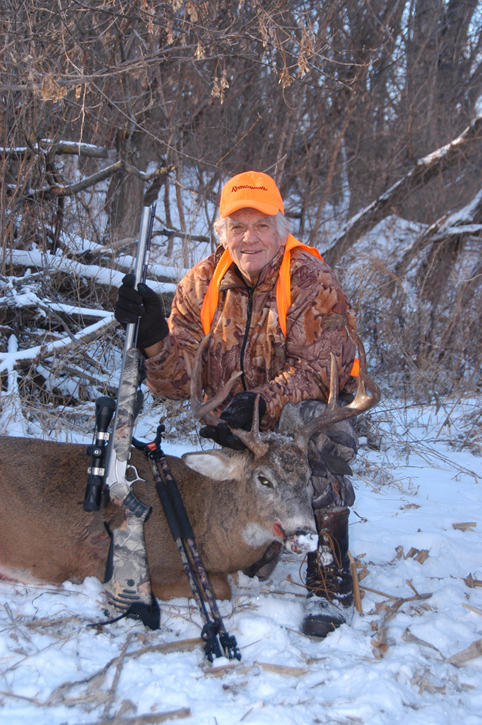 Finally, he spotted the antlers when the wind was right, and after a painstaking two-hour stalk that involved a lot of belly crawling, he eased into shooting position at 80 yards and put a shotgun slug through the big buck’s vitals. 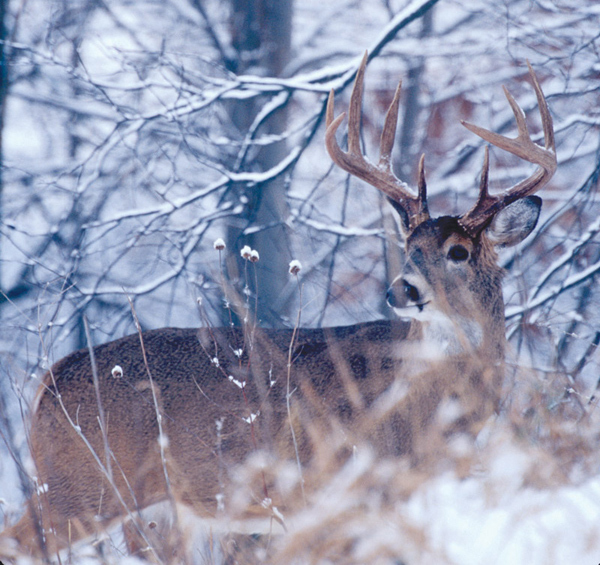 Stepping out of your own hunting rut may be the best way to tag a wary buck late in hunting season. Sometimes, it’s the only way.